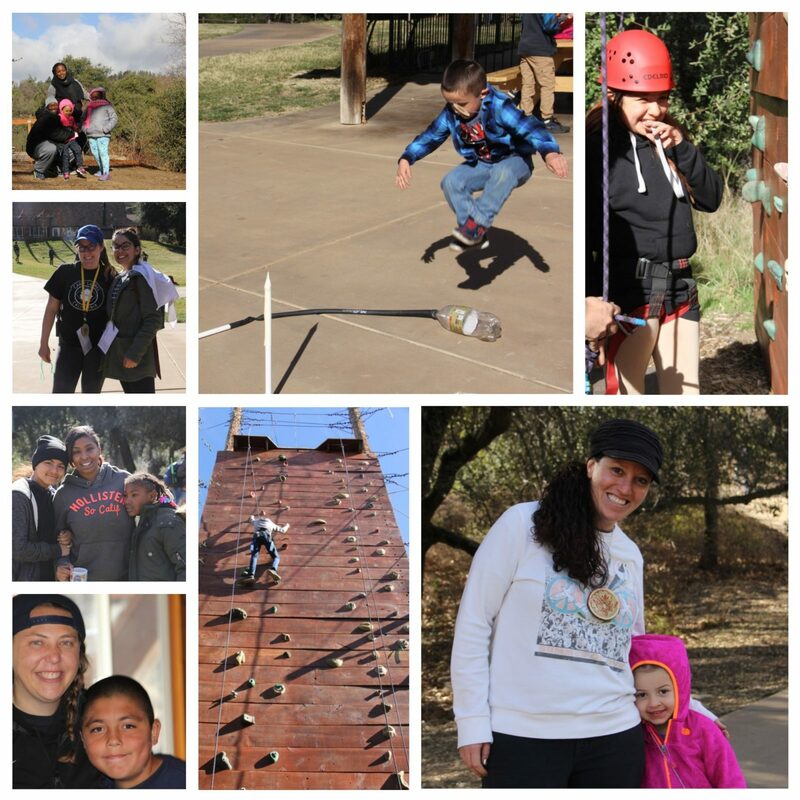 Winter Family Camp 2018 took us back to Camp Stevens in Julian, California. The camp was led by past camper (now counselor) “Button” who came back to serve as our Program Director for her second winter camp in a row. Button thoughtfully crafted this camp’s theme, “Ohana”, emphasizing the importance of family, both given and chosen, during the four day camp. “Ohana” celebrated the beauty of Native Hawaiian and Polynesian culture’s love of families. Winter camp was not only fun, but provided campers so many growth opportunities throughout the weekend, whether it was trying something new for the first time, making new friends, or gaining independence through choosing their own free choice activities. On the first day of camp, families were welcomed with a delicious homemade pizza lunch, made from the ingredients of Camp Steven’s garden. Families then went off to their cabin groups to unpack and get to know each other. Many of our younger campers experienced their first night “away” from their parents – their first step into independence. Many of our older campers reconnected with old friends and helped guide other campers through their first day. Our parents were excited to have a break from their kids and enjoyed having time to connect. 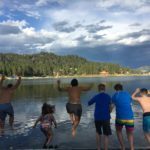 Connections and a sense of support is a valuable outcome of our parent programming at family camp. Thank you counselors for watching the kids so the parents can have this valuable time to connect with one another! After dinner, campers gathered in front of the dining hall for our opening program; A Night Under the Stars. Campers spent the night finding constellations through a telescope, mapping constellations with shadow boxes, and learning the history of constellations and greek mythology. Our CIT’s exercised their leadership skills through acting out traditional star stories, allowing younger campers to step outside of their comfort zone and explore their acting skills. Campers also had a lot of fun preparing their camp counselors for a trek into space, dressing them up in the most appropriate space clothing and giving them tips on their moonwalks. The next morning campers enjoyed a morning full of family time. Families were able to leave their cabin groups to sit with their families and start their days together. After breakfast, first period was family hour. Family hour was a new favorite addition to camp program allowing families to spend quality time together and reconnect away from their normal routines of life down the mountain. 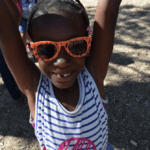 Campers were able to rotate around activities like kite flying, piñata making, rocket launching, and sports. 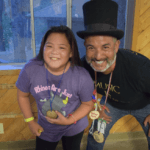 We were also joined by a few special visitors throughout the weekend who provided specialty programs that allowed campers time to develop coping skills, try new things, and work collaboratively through exploration. Ready came up as an arts and crafts facilitator and taught the campers how to make lava lamps. Penguin led yoga, a very welcomed hour of relaxation and mindfulness for all of our campers but especially our parents. Chef and Frenchie surprised our campers and taught them how to make toffee and marshmallows. The campers were excited to have an extra sweet treat that day but our parents were even more excited to try Chef’s specialty: cheesecake! The night ended with a classic evening program: Family Feud! In their cabin groups, campers had to work together to find the top answers to the surveys! Try as they may, no one was able to beat the Moms and Tots, who took home the win! On the last day of program, campers woke up to find it was snowing! This was the first time many of our and volunteers had ever experienced snow. Camper spent the rest of the day enjoying all of their camp activities with a little extra chill! 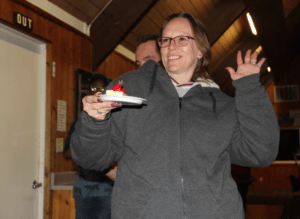 That night at final campfire we were very excited to give out two very special awards! Our Apollo Award went to long time camper, Morgan! This award was extra special because Morgan was able to receive it from her long time mentor, Giggles. The second award went to a first time camper but long time dad, Brandon! He received the parent award for his spirit at camp. 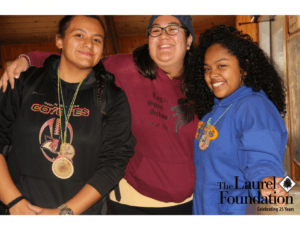 Campers went home feeling the love from every member of their Camp Laurel family. We also would like to give an extra special shout out to our camper, Johnny, who took 90% of the photographs at camp. We are excited that camp has led Johnny to discover a true talent and eye for photography. Thank you for capturing all those magical growth moments at camp, Johnny! We are so glad you found your special talent and are so grateful for all the beautiful photos you took!